U2 On 'The Joshua Tree,' A Lasting Ode To A Divided America Bono and The Edge explain why, 30 years later, the biggest-selling album of their career feels disquietingly resonant. 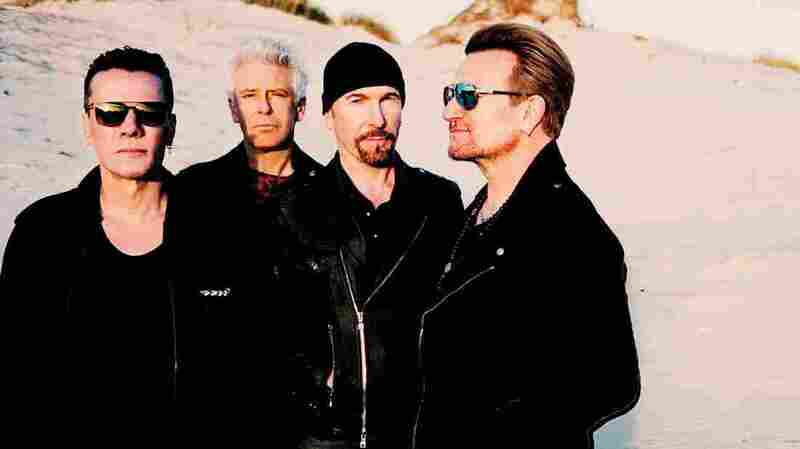 Larry Mullen Jr, Adam Clayton, The Edge and Bono will take U2's The Joshua Tree on the road this summer for the album's 30th anniversary. "Usually Edge, when we have a greatest hits collection coming out, has to struggle to get me to listen to it, because it feels dead to me," Bono says. "Plus, I don't like the sound of the singer very much, especially the one with the mullet in the 80's." The hairstyles of that era of U2 may be dated; the music, they feel, is not. The Joshua Tree appeared in stores in 1987 and sold more than 20 million copies, making it one of the major pop culture events of that decade. On it, these Irish musicians were writing about the America of the moment: A time of social change at home and the climax of the Cold War abroad. "Ronald Reagan was in power, and Maggie Thatcher in Britain. The miner's strike was a big issue in Britain, a lot of unrest," The Edge says. "I think we all realized that things had almost come full circle — like the environment in which that album was written is more similar to the political environment we are in today than it has been since." Bono and The Edge spoke with NPR's Steve Inskeep, who asked the singer and guitarist to explain the mood The Joshua Tree was made to capture. Hear the radio version at the audio link, and read more of their conversation below. Steve Inskeep: Is it true that this album was going to be called The Two Americas at one point? Bono: Yeah, it was. There's two Americas: There's the mythic America and the real America. We were obsessed by America at the time. America's a sort of promised land for Irish people — and then, a sort of potentially broken promised land. If the Declaration of Independence is like the liner notes of America, we're like annoying fans that follow politicians into the bathroom and say, "But it says here, 'We pledge our sacred honor.' What's that about?" And people suffer us talking about America because we love it so much. Rather arrogantly, we don't think you own it. We think America is an idea that belongs to people who need it most. Inskeep: One song that really sticks in my head from hearing it years ago is "Bullet the Blue Sky." What is happening in that song? Is there a real event back behind it somewhere? Bono: As well as Live Aid and a trip to Ethiopia, to try to figure out how poverty can exist in a world of plenty ... I went to El Salvador, trying to understand the conflict there. Inkseep: There was a conflict there, and in Nicaragua as well. This is during the Cold War, where the US supported wars to push back against what was seen as the communist threat to Central America. Bono: And I witnessed some things in Salvador which were really unspeakable. We witnessed a firebombing in rebel-backed territory, watching people's livelihoods get exploded and feeling the ground shake, even though we were safe enough ourselves. It was something that made, as you can imagine, a bit of an impression: Seeing bodies thrown out of cars on the side of the road, terrible stuff that was going on. Watching foreign policy work itself out in a small country. That's where "Bullet the Blue Sky" came from. Edge: It's actually a great example of U2 working as a band. I had a guitar part, and Adam and Larry started playing along — and they played against this guitar part in half-time. I remember being quite frustrated and a little annoyed at them: "Why are you playing half-time?" The engineer and Bono were in the control room going, "Wow, that was amazing!" And I was like, "No, you don't understand — that was wrong. That was not what it was supposed to be." [But] it was a great lesson for me: We rewound, hit play, and heard this bass part that Adam had come up with that was so wild, so brilliant, and not what I would have ever put on that guitar part. Bono: It was in a different key! Edge: From that, we built the rest of the music. And as Bono's describing, he had some words that he'd started working on based on these experiences that — and it was clear that the mood of this music suited the experience that he'd had. Inskeep: I'm looking at the lyrics to "Bullet the Blue Sky," and there's a spoken word-verse that feels, to me, like a dream sequence. It begins, "I can see those fighter planes," and at the end you're in a room listening to a saxophone. It feels like you're moving from one scene to another. Do you know what's happening there? Bono: "This guy comes up to me, his face red like a rose on a thorn bush, like all the colors of a royal flush. And he's peeling off those dollar bills, slapping them down — one hundred, two hundred -- and I can see those fighter planes." At the time that was Ronald Reagan in my head, and the reason was that I'd [seen a mural in El Salvador with Reagan in it]. I was standing in this church going, "Wow, what's Ronald Reagan doing there on the chariot?" And they said, "It's Ronald Reagan as the Pharaoh, and we are the children of Israel running away." Really, the image in that dream sequence is the stuff that happens behind oak doors, down marbled corridors, that works its way into the everyday lives of good people who get caught up in a conflict. Inskeep: Now that you're revisiting these songs, and you'll be playing them on tour, do you feel an urge to revise or rewrite any of them? Bono: I change the lyrics all the time. Not just because I don't remember the original ones [laughs], but because I felt the first ones were just sketches a lot of the time. I'm proud of the thoughts behind the material, but sometimes not the expression of the language. So I do change all the time. Inskeep: I'm curious now, have you ever been like Ella Fitzgerald in that famous "Mack The Knife" rendition where she just has no idea what the words are anymore, and she's just kind of making up things? Bono: That's how we write songs! I've been making s*** up on the microphone since we were 17 years old. Sometimes it turns into words, sometimes it's just like sound paintings. I've only got semi-literate recently. But then, there's an age old tradition, isn't it: "A-womp bop a-looma, a-womp bam boom." I mean, it's just ... sound is everything. Producer Gabriela Saldivia and web editor Daoud Tyler-Ameen contributed to this story.